Main minorities and indigenous peoples: Azeris (16 per cent), Kurds (10 per cent), Lur (6 per cent), Baluch and Arabs (both 2 per cent), Turkmen and other Turkic tribes (2 per cent), and other nomadic peoples comprising about 1 per cent of the total population. Other minorities include Armenians and Assyrians, as well as an Afro-Iranian minority. Main languages: Persian (official), Persian dialects, Azeri and other Turkic dialects, Kurdish, Gilaki and Mazandarani, Luri, Baluchi, Arabic, and other non-Turkic languages. Main religions: Islam (99 per cent) – 90 per cent of which practise Shi’a Islam – strongly dominated by the Twelver Ja’fari School (referred to as Ithna’ashari in Arabic), and a minority of followers of Sunni Islam (9 per cent) and other Islamic groups such as Isma’ili Islam and Ahl-i Haq. Other religious groups include Bahá’í (numbering more than 300,000), Christians of various denominations (almost 300,000) Zoroastrians (Mazda-yasnie) (30-35,000), Jews (20,000) and Sabean Mandaeans (5,000-10,000). Out of a population of more than 80 million people, Persians comprise the largest ethnic group in Iran at approximately 61 per cent. Other ethnic minority groups include Azeris (16 per cent), Kurds (10 per cent), Lur (6 per cent), Baluch and Arabs (both 2 per cent), Turkmen and other Turkic tribes (2 per cent), and other nomadic peoples comprising about 1 per cent of the total population. Other minorities include Armenians and Assyrians, as well as an Afro-Iranian minority. The most commonly used languages in Iran are: Persian (official), Persian dialects, Azeri and other Turkic dialects, Kurdish, Gilaki and Mazandarani, Luri, Baluchi, Arabic, and other non-Turkic languages. However, the state’s censuses have not collected data on language or ethnicity for over three decades, making it very difficult to gauge the country’s linguistic and ethnic composition. The last time data on ethnicity and language were collected was in 1976, during the second Pahlavi monarchy (1941–1979). The nationalism espoused by this regime left little room for any form of ethnic representation that could have lent itself to political expression. This meant that the Pahlavi state had a vested ideological interest in portraying the country as largely homogeneous and principally Persian. Accordingly, it put Persians at 51 per cent of the population, Azeris at 25 per cent, and so on. These statistics were not verified independently, but they continue to be circulated uncritically by many. Therefore any statistical report on Iran’s ethnic makeup ought to be read cautiously. Verifiable and independently assessed disaggregated data on minorities in Iran would require a political climate and systematic machinery which is currently far out of reach. The country’s different ethnic communities are concentrated in different parts of the country, with Azeris are mostly located in the northwest (West Azerbaijan, East Azerbaijan, Ardabil and Zankan provinces), Lors in the west (Khuzestan, Chehar Mahal and Bakhtiyari, Kohkiloye and Boyer Ahmed and Elam provinces), Arabs in the west (Khuzestan province), Kurds in the northwest (West Azerbijan, Kermanshah and Kurdistan provinces), Baluch in the southeast (Sistan and Baluchistan) and Turkmens in the north (Golestan and North Khorasan). The main religions in Iran are: Islam (99 per cent) – 90 per cent of which practise Shi’a Islam – strongly dominated by the Twelver Ja’fari School (referred to as Ithna’ashari in Arabic), and a minority of followers of Sunni Islam (9 per cent) and other Islamic groups such as Isma’ili Islam and Ahl-i Haq. Other religious groups include Bahá’í (numbering more than 300,000), Christians of various denominations (almost 300,000) Zoroastrians (Mazda-yasnie) (30-35,000), Jews (20,000) and Sabean Mandaeans (5,000-10,000). Most Kurds, Turkmens, Baluch and some Arabs are Sunni, and can be discussed as ethnic communities since they do not form a cohesive coherent whole as Sunnis. Instead the various communities tend to express their identity in ethnic terms. Sunnis represent some 9 per cent of Iran’s population. The Dom (‘Gypsies’) migrated from the Indian sub-continent as early as the sixth century and speak various dialects of the Domari language. They are among the most marginalized peoples of Iran: not counted in any official statistics, living in isolated – sometimes fenced-off – ghettoes, and often deprived of employment and education because they lack identity cards. Many of the thousands of street children in Tehran are Dom. Iran has many minorities, including Ahwazi Arabs, Azeris, Bahá’is, Baluchis, Christians and Kurds. Activists and members of those groups continued to face discrimination and marginalization by the Iranian authorities. 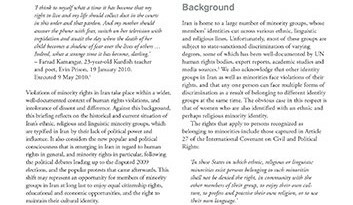 Violations of minority rights in Iran take place within a wider, well-documented context of human rights violations, and intolerance of dissent and difference, and are typified in Iran by their lack of political power and influence. For instance, minority languages are prohibited in both government institutions and as subjects to be taught in schools. Schools in minority regions are very poor and the rates of drop-out and illiteracy are reportedly higher in those areas than the national average. In addition to the often profound disparities evident in regions with large ethnic minority populations, the elaborate machinery of day-to-day Iranian society ensures that Islam continues to be applied rigidly in many aspects of civil and political life. All Iranians seeking public sector employment or professional advancement, or to enter higher education, are subjected to screening sessions known as gozinesh, where they are assessed regarding their loyalty and commitment to the Islamic Republic. Non-Muslims and even Muslims who ‘fail’ these screenings are either excluded or eventually purged not only from the upper echelons of power, but also from more minor positions of ‘influence’ in society, such as studying at university or securing university teaching positions. Religious groups suspected of attempting to convert Muslims, and converts themselves, are particularly vulnerable to spurious charges and find themselves under near-constant surveillance. This leads to particular persecution of Bahá’ís and evangelical Christians. 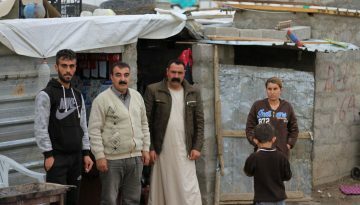 Members of religious minority communities – whether non-Muslim or Muslims of schools other than Twelver Ja’fari Shi’a – have all also been subject to illegal land confiscation, employment loss and discrimination, debilitating restrictions on the exercise of their faith, arbitrary arrest and detention, bureaucratic discrimination, abductions, and an array of other difficulties that seriously undermine the legal position of the regime apropos of its own constitution. Persecution against members of the Bahá’í faith has continued, with the government still denying them freedom of religion: at least 85 Bahá’ís were reportedly held in prisons as of October2016 2016. Security forces have continued to target Christians who have converted from Islam. Cultural and political activities pertaining to minorities, specifically Azeri, Kurdish, Arab and Baluch, are still heavily restricted. Persecution of ethnic minority individuals also continues, based on combined ethnic and religious grounds. Authorities executed 20 men who are believed to have been amongst a group of 33 Sunni Kurdish men arrested in 2009 and 2010 on charges of ‘enmity against God’ and accused of being members of a terrorist organisation. Three Arab citizens in Khuzestan were also executed on terrorism charges. Iran is surrounded by seven countries: Azerbaijan, Turkmenistan and Armenia to the north, Afghanistan and Pakistan to the east, the Gulf to the south (with Bahrain, Kuwait, Oman, Saudi Arabia, Qatar and the United Arab Emirates across the Gulf), and Iraq and Turkey to the west. 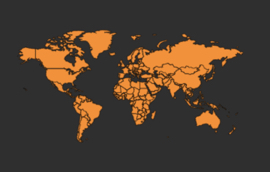 This geographical location has a significant bearing on the country’s minorities. Ever since the foundation of the Iranian State (formerly known as ‘Persia’ until 1935) by the Achaemenids in the sixth century BCE, Iran has experienced alternating phases of political coherence and regional disintegration. The state has included indigenous groups and absorbed periodic waves of tribal invasions. Historical accounts of Africans entering southern Iran can be traced back to the 17th century. East Africans were enslaved and sent to Khuzestan, Baluchistan and Kerman provinces in southwestern Iran, working in sugarcane or date plantations or as sailors, while others worked as nurses or personal tutors in affluent households. Ethnic differences in Iran only began to acquire political importance during this century when the state had the means to enforce centralization. Reza Khan (from 1925 Reza Shah Pahlavi), who seized power in 1920, sought to forge the disparate peoples of Iran into a single nation. During his reign (1925–1941) he advocated the complete destruction of tribal culture and brutally imposed sedentarization on nomadic communities. The state adopted Persian, spoken by 45 per cent of the population, as the official language and used it for all administrative and educational purposes, banning publication in other languages. It also imposed western dress on the population and attempted to settle nomadic pastoralists, by force where needed. ‘Persianisation’, as it came to be known, also involved changing Azeri, Kurdish, Baluch, Arab and Turkmen geographic names to Persian ones, and forcing parents to give Persian names to their children. These measures created a sharp sense of difference among those peoples which did not belong to the dominant Persian community. When Reza Shah was forced to abdicate in 1941, at the behest of the wartime Allies who were occupying the country, state-sanctioned oppression of Iran’s non-Persian peoples decreased. Most if not all of the country’s nomads (the Qashqai, Bakhtiari and others) attempted to return to their nomadic lives, but did so with considerable bitterness after two decades of systemic violence against their peoples. This bitterness was not limited to Iran’s nomads. Grievances relating to structural discrimination (for instance in regard to employment opportunities), the free use of local languages like Azeri and Kurdish, and the suppression of minority cultural practices, were widespread and contributed to rebellions in the northwest of the country. In December 1945, the Azeris revolted and established an autonomous state of their own with the help of the Soviet Union. The Kurds did the same in their region in January 1946, also with the support of the Soviets. Neither of the new states lasted beyond 1946, however, when Soviet troops withdrew from the region, allowing the national army to return and mete out punishment to combatants and non-combatants alike. The south of the country was no more peaceful, with organized tribal uprisings by the Qashqais and their allies in the 1940s, as they sought to reassert their claims to self-determination in the political vacuum left by Reza Shah’s abdication. Tensions between different ethnic groups continued throughout the twentieth century, with most grievances centring on the freedom to teach minority languages in schools, appoint representatives of minority groups to municipal government authorities, establish non-Persian language media, and receive equal treatment in public services and courts of law. Under the rule of Reza Shah’s son, Mohammad Reza Pahlavi, this sense of difference increased further. Mohammad Reza Pahlavi’s rush to industrialize and modernize was concentrated on the central and northern areas of Iran, particularly through the White Revolution of 1963, which was heavily influenced by the French system of governance. These were not the first attempts of the state to achieve modernization and Westernization, however. As early as the mid-nineteenth century, European influences were already manifested in government architectural and structural schemes. At the bequest of the Qajar prince of Persia, Abbas Mirza, Persian students were sent to European universities to study and return with knowledge they had acquired, which became evident with the establishment of the first Ministry of Education in 1855, which was modeled after the French system. It was during this time as the transition towards modernization and nationalism peaked that the emancipation movement of enslaved Africans also surfaced. By 1928, the parliament had implemented a law to abolish slavery throughout the state. By 1976 the average level of urbanization in Iran was 46.8 per cent; the level in Kurdish and Baluchi regions, at opposite ends of the country, was less than 25 per cent, however, while that for the Persian-dominated Central Province was over 80 per cent. Other indices, for example literacy or electrification of homes, followed similar proportions. The non-Persian periphery felt it was subsidizing the industrialized core and this economic discrimination fueled community self-awareness on the periphery. The Pahlavis liked to emphasize the ancient and pre-Islamic nature of the Iranian state. However, Iran had a strong Shi’a tradition going back to the initial schism with the Sunnis. The Safavid dynasty had adopted Shi’a Islam in the sixteenth century, and the Pahlavis underestimated the ability of the Shi’a clergy to mobilize popular disapproval and dissatisfaction, as demonstrated in the 1979 Islamic revolution. In the spring of 1979, following the Shah’s overthrow, the Islamic Republic of Iran was proclaimed. All ethnic minorities, except the Azeris, sought autonomy, hoping that Tehran would be unable to maintain its grip on the periphery. The new regime feared that conceding autonomy to one community would lead to the disintegration of the state. Ayatollah Khomeini (1979–1989), who had become the undisputed leader of the revolution, was not at all sympathetic to the idea of greater autonomy and freedom for Iran’s minority populations. He also argued that ethnic autonomy violated the universalism implicit in Islam. In March 1979, he formally authorized the use of the military to suppress Kurdish uprisings in the provinces of Western Azerbaijan and Kurdistan, Arab unrest in Khuzestan, and the resistance of Turkmens in the northeast, all of which led to considerable bloodshed. No one knows how many perished in these struggles, but estimates are in the thousands. The situation of minorities has shown little signs of improvement in the ensuing decades, with continued repression on civil freedoms and the ongoing marginalization of minority-dominated regions. In 2005, following the election of Mahmoud Ahmadinejad as President of Iran, renewed dissent broke out among many minority communities that at times spilled over into violence, including riots and targeted attacks on government officials, apparently in protest against Ahmadinejad’s ‘Shi’a Persian’ nationalism, with its strong ethnic and religious undertones. In 2009, following his second electoral win, protests broke out over allegations of electoral rigging that came to be known as the ‘Green Revolution’ led to at least 80 deaths and thousands of arrests. Upon establishing the Islamic Republic in 1979, the first ‘supreme leader’ Ayatollah Khomeini took the position of the rahbar (or leading cleric), now succeeded by Ayatollah Ali Khamenei, who is the current leader of the Islamic Republic of Iran. Today it brings together aspects of a modern democracy alongside Islamic theocracy, with elected and unelected bodies that at times work through parallel structures of power. The explanation lies in the concept of velāyat-e faqīh, as propounded by Khomeini, namely to entrust responsibility to a noteworthy faqīh or jurist in Islamic canon law. The Islamic Republic of Iran has proven a highly centralized government, strongly opposed to any form of autonomy to the regions as risking the disintegration of the state. The early revolutionary period and the subsequent invasion of Iran by Iraq in 1979/1980 led to some rebellions and attempts to claim autonomy, particularly in the Kurdish areas. However, those claiming secession, as well as the communities they came from, paid a heavy price for this. Article 5 of the Constitution defines Iran as a Shi’a Republic. Article 115 debars non-Shi’as from presidential office. Article 12 of its Constitution declares Twelver Ja’fari Shi’a Islam as its official religion. The state is also currently under international scrutiny regarding discrimination against women running for political office. It was reported that all 30 female candidates running for presidential office in the June 2013 election were disqualified, which led to questions regarding the ‘fairness and transparency of the vetting procedures.’ An even more stark pattern occured in the May 2017 election; out of the 137 women who registered to run for office, none were selected as candidates. 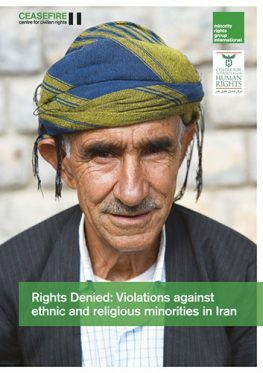 Article 19 of the Iranian Constitution states: ‘All people of Iran, whatever the ethnic group or tribe to which they belong, enjoy equal rights; colour, race, language and the like, do not bestow any privilege.’ However, discrimination on the basis of religion and ethnicity is rife in Iran. Minority languages are suppressed and many minorities are disadvantaged politically, socially and economically. The treatment is not constant across minority groups. The Islamic Republic of Iran has a discerning minority policy which distinguishes between the history of the demands of that minority, whether it constitutes an ethnic or religious minority, their relationship with outside actors, and whether and in what area a threat is perceived from that group. These factors determine the disadvantage and repression they may suffer. Hence, Azeris suffer linguistic and cultural discrimination in order to stem Azeri nationalism, the tolerance of Kurdish expression ebbs and flows in some areas depending on the latest encounter between Kurdish political activists and government forces, but intolerance of evangelical Christians and the persecution of Bahá’ís on religious grounds has remained largely intact throughout the political fluctuations in the country. 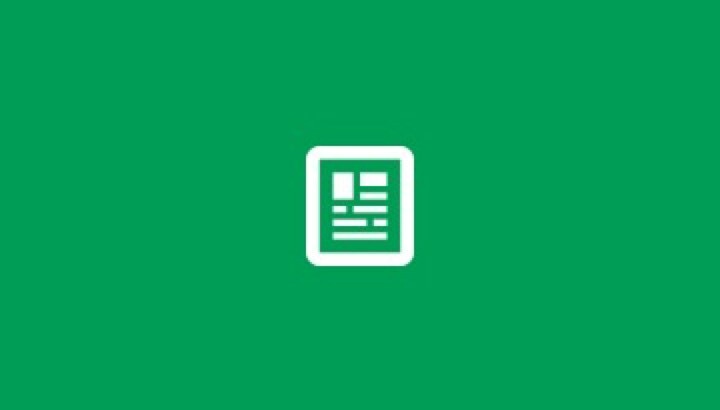 Nevertheless there have been some developments – the position of Ismailis in Iran has improved, whereas official harassment of Sufis increased after President Ahmadinejad took office in August 2005.One tentative sign of progress in Iran was the election in 2013 (and again in 2017) of Hassan Rouhani, a moderate reformist cleric, who among otherm promises had committed to expanding rights for minority communities. However, critics have accused him of failing to deliver, with religious minorities – in particular Bahá’ís, Christians as well as members of non-Shi’a Muslim denominations – still subjected to mistreatment, arbitrary detention and denial of freedom to worship.